Given the nature of Immediate Media's portfolio of children and youth titles it isn't surprising that the publishing company is going to leverage the popularity of its new LEGO Star Wars Trading Cards collection to promote sales of three of its magazines. After all, it is what Blue Ocean in Germany did. 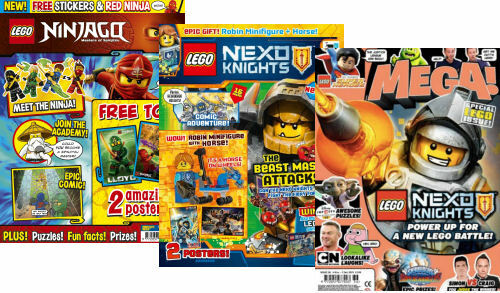 In a similar vein to the monthly LEGO Star Wars Magazine published by Egmont, there are two LEGO titles that are being included in the co-promotion: LEGO Nexo Knights and LEGO Ninjago. The third publication is Mega Magazine, a comic full of games, activities, posters and competitions that is aimed at boy aged 7-10. These magazines typically sell for £4 so are a more costly purchase than the standard booster packs that are available for £1. Nor will the cover-mounted booster packs have any limited edition cards in them.